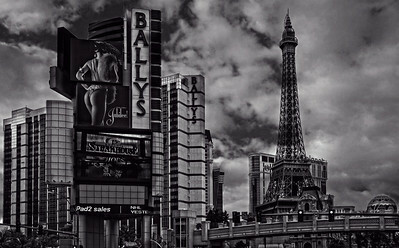 Bally's Las Vegas, formerly the MGM Grand Hotel and Casino, is a hotel and casino on the Las Vegas Strip in Paradise, Nevada, owned and operated by Caesars Entertainment. The hotel features 2,814 extra-sized guestrooms that are 450 sq ft or larger and over 175,000 sq ft of banquet and meeting space. 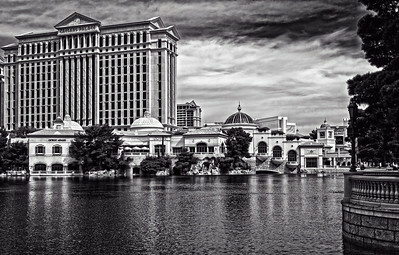 The casino occupies 67,000 sq ft. About 75% of the rooms are in the North Tower, and have been renovated in 2004. The remaining rooms are in the South Tower with views of Paris Casino, with a limited number renovated. 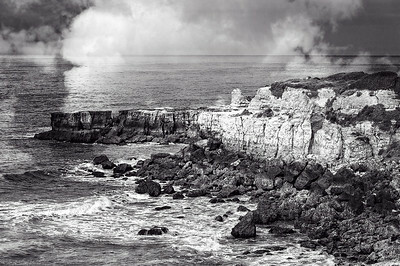 A misty morning over one of many rock formations along the beaches in Albufeira, Portugal. This region is also referred to as part of the Algarve. 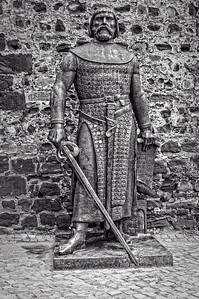 Statue of Sacho I in front of the Castle of Silves. The castle is in the civil parish of Silves in the municipality of Silves in the Portuguese Algarve. During the French Revolution this became the site of the guillotine. 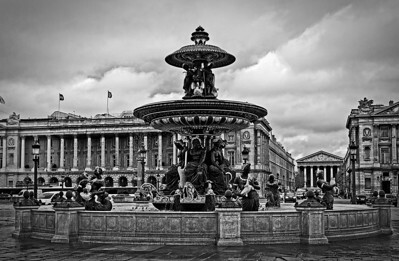 The square became the Palace de la Concorde in 1795. 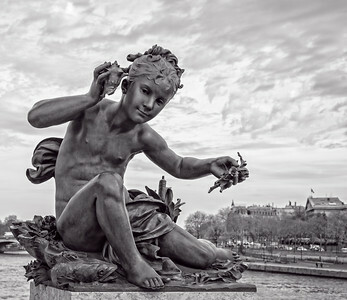 The Palace De Chaillot was constructed for the 1937 World Fair, designed by Boileau, Carlu und Azema built on the previous building, the Trocadero. 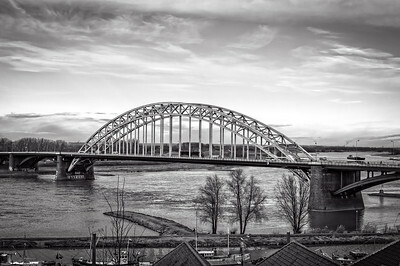 AKA, The Waalbrug, the arched bridge over the Waal River in Nijmegen. At the start of the Second World War the Dutch combat engineering units blew up the bridge to stop the German army's advance. During the occupation the Germans restored the bridge and from 1943 it was in use for traffic again. In 1944 the Germans planned to blow up the bridge again, but Jan van Hoof, a Rover Scout and member of the Dutch Resistance, managed to prevent this. On 20 September 1944, allied forces conquered the bridge. A plaque was added to the bridge as a reminder of van Hoof's actions. The Pavillion Richelieu in the Louvre. 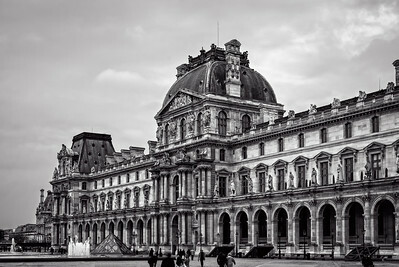 The Richelieu Wing is on the northern side of the Louvre, next to Rue de Rivoli. The Richelieu was named after Armand Richelieu, 17th Century French statesman, cardinal and monarchist. 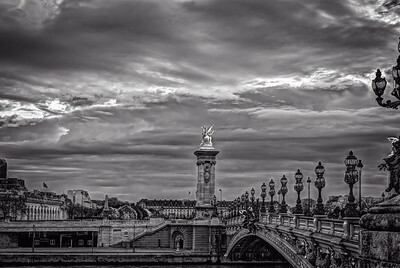 The Ponte Alexandre III is considered by many to be one of the prettiest bridges in Paris. The bridge is located south of the Champs Elysees at the southern end of Avenue Winston Churchill in the 7th and 8th arrondissements. 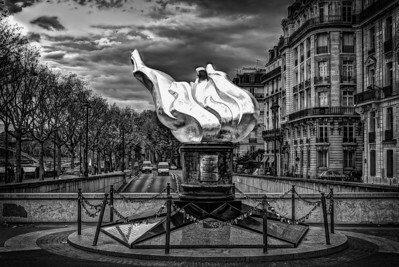 It crosses the Seine river and leads to Les Invalides, the final resting place of Napoleon. The bridge has four granite columns, two on each side of the river, which help it anchor the piers that support its single span. The columns are topped by gilded statues of the Fames. On the Right Bank are the Fame of the Science and the Fame of the Arts. Statues of Contemporary France and France of Charlemagne are at their bases. 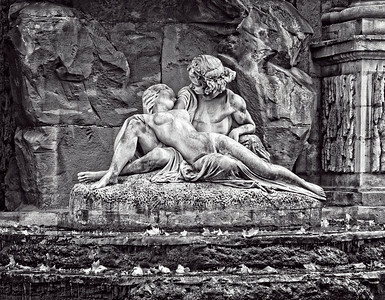 On the columns of the Left Bank, there are the Fames of Commerce and Industry. 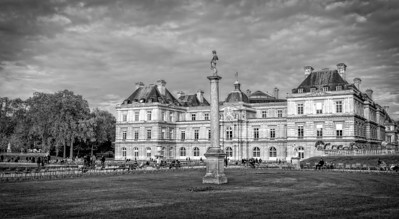 Beneath them there are sculptures of the Renaissance and Louis XIV. Groups of lions also adorn the ends of the bridge. The lions on the Right Bank were designed by George Gardet and the lions on the Left Bank are by Jules Dalou. The bridge was begun when Czar Nicholas II, in a gesture of friendship between the people of France and the people of Russia. He laid the foundation stone in October, 1896. The bridge was finally completed in 1900, in time for the Universal Exhibition, or World’s Fair. 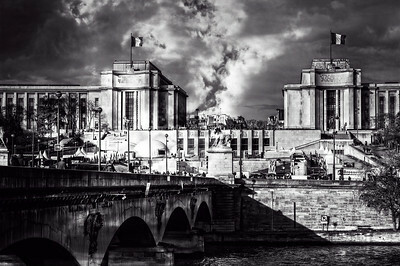 Since the fair was happening on both sides of the Seine, the bridge allowed visitors to stroll back and forth across the river to see all of the exhibits. 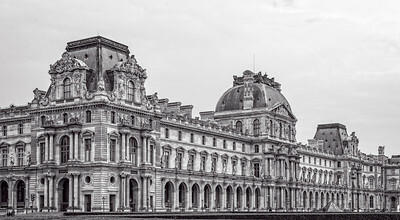 The lavish style of the bridge echoes the Grand Palais, which is found on the Right Bank of the Seine and was also created for the Exhibition. The bridge was built under rather strict guidelines to make sure that it did not compete with the views down of Champs Elysees or Les Invalides. The bridge consists of a single 18 foot high span that arches gently across the river. The bridge is about 132 feet wide and 353 feet long. The bridge’s designers were Gaston Cousin and Joseph Cassien-Bernard. It was engineered by Amédée d’Alby and Jean Résal. 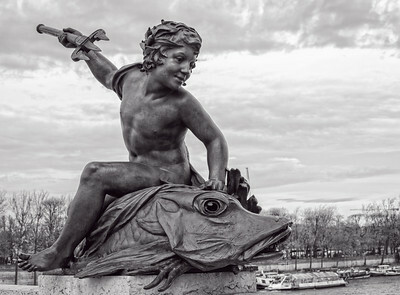 Besides these men, the bridge’s sculptures were created by several artists, including Emmanuel Frémiet, Gustave Michel, Alfred Lenoir, Gardet, Pierre Granet, Clément Steiner, Jules Coutan, Laurent Marqueste, Dalou and Georges Récipon. The one and only. One of my favorite places to stay. 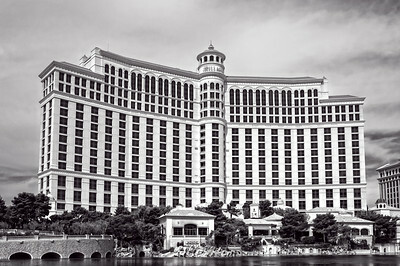 Bellagio is a luxury hotel and casino on the Las Vegas Strip in Paradise, Nevada. It is owned by MGM Resorts International and was built on the site of the demolished Dunes hotel and casino. Inspired by the Lake Como town of Bellagio in Italy, Bellagio is famed for its elegance. One of its most notable features is an 8-acre (3.2 ha) lake between the building and the Strip, which houses the Fountains of Bellagio, a large dancing water fountain synchronized to music. Home to Maria de' Medici of Florence. 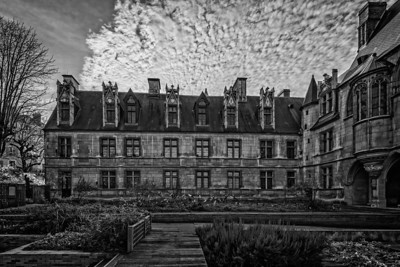 She acquired this mansion in 1615 from Duke Francois de Luxembourg. 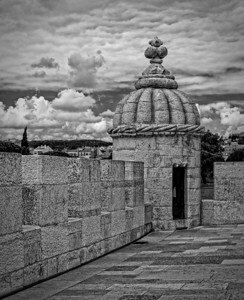 Padrão dos Descobrimentos (Monument to the Discoveries) is a monument on the northern bank of the Tagus River estuary, in the civil parish of Santa Maria de Belém, Lisbon. 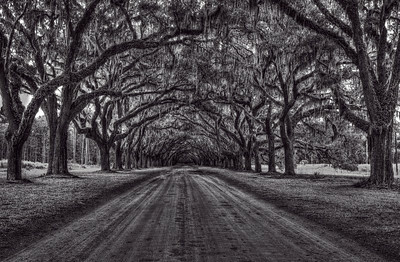 Located along the river where ships departed to explore and trade with India and the Orient. 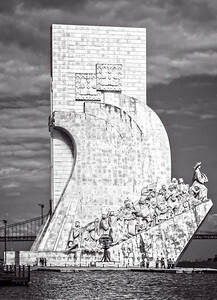 The monument celebrates the Portuguese Age of Discovery (or Age of Exploration) during the 15th and 16th centuries. Prinsengracht (Prince's Canal) is the fourth and the longest of the main canals in Amsterdam. 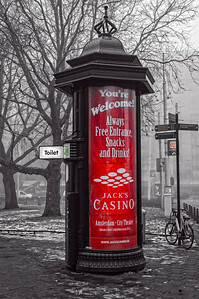 It is named after the Prince of Orange. Most of the canal houses along it were built during the Dutch Golden Age of the United Provinces. 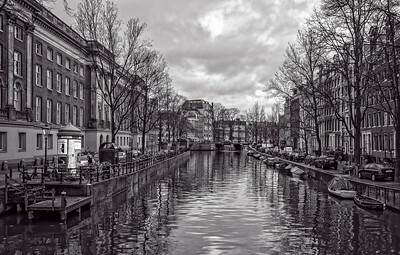 The bridges over the Prinsengracht canal connect with the streets in the Jordaan. 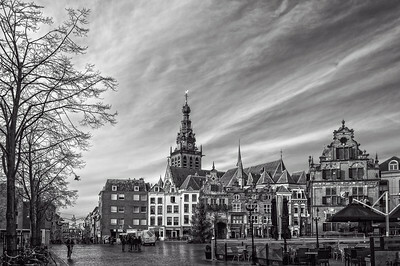 Notable buildings along Prinsengracht include the Noorderkerk (Northern Church), the Noordermarkt (Northern Market), Anne Frank House, the Westerkerk (Western Church, Amsterdam's tallest church) with the Homomonument (Gay Monument), which actually faces Keizersgracht. The St. Stephen is built in a mix of late Romanesque and both early and late Gothic styles, while the spire on top of the tower is in Renaissance style. St. Steven (St. Stephen) is the original catholic name of this church; after the church became a protestant one its official name became Grote Kerk (Great Church), but usually the name St. Steven is used. The first church at this location was built between 1254 and 1273. This was a Romanesque basilican church of which parts of the west facade and tower are recognizable in the current Gothic church. The Louvre Pyramid (Pyramide du Louvre) is a large glass and metal pyramid, surrounded by three smaller pyramids, in the main courtyard (Cour Napoléon) of the Louvre Palace (Palais du Louvre) in Paris. 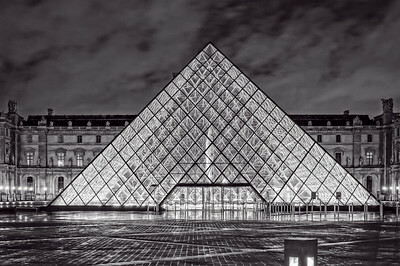 The large pyramid serves as the main entrance to the Louvre Museum. 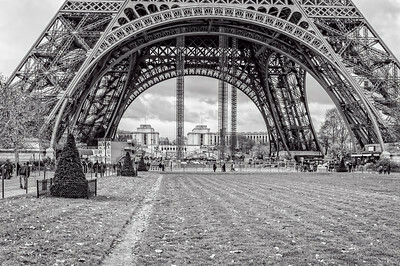 Completed in 1989, it has become a landmark of the city of Paris. Commissioned by the President of France François Mitterrand in 1984, it was designed by the architect I. M. Pei, who is responsible for the design of the Miho Museum in Japan and IBM Corporate Office Building in Purchase, New York, and Rock and Roll Hall of Fame Museum in Cleveland, and the National Gallery of Art (East Building) in Washington, D.C. among others. The structure, which was constructed entirely with glass segments, reaches a height of 20.6 metres (about 70 feet); its square base has sides of 35 metres (115 ft). It consists of 603 rhombus-shaped and 70 triangular glass segments. The rigging holding the pyramid together was built by Navtec Rod Rigging of Littleton, MA under the direction of Ken King and his partner Mr. Eliason and the experienced design team of Navtec Rod Rigging. In 1989 TriPyramid Structures was formed to use Navtec Rod Rigging in architectural design and building. http://www.tripyramid.com/. The pyramid structure was engineered by Nicolet Chartrand Knoll Ltd. of Montreal (Pyramid structure / Design Consultant) and Rice Francis Ritchie (also known as RFR) of Paris (Pyramid Structure / Construction Phase). The pyramid and the underground lobby beneath it were created because of a series of problems with the Louvre's original main entrance, which could no longer handle the enormous number of visitors on an everyday basis. Visitors entering through the pyramid descend into the spacious lobby then re-ascend into the main Louvre buildings. The Sacré-Coeur Basilica is a white domed Roman Catholic Church that is a landmark found in Paris. 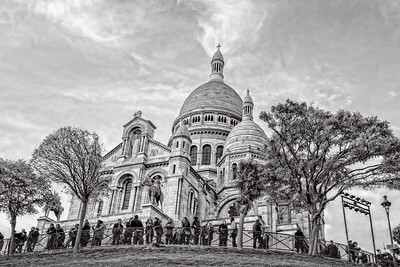 The term Sacré-Coeur Basilica means the “Basilica of the Sacred Heart.” The Basilica crowns one of the highest hills in Paris on the butte of Montmartre offering one of the best views of the city. Many people come to Sacré-Coeur Basilica to admire the exceptional view of the city from a height of 271 feet above the ground. In fact, this is the second highest point in the city after the Eiffel Tower. The basilica is in the shape of a Greek cross, with its crypt being made in the Romano-Byzantine style. 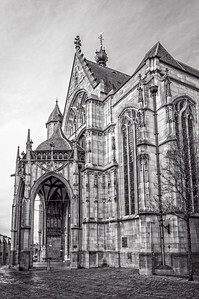 The site of this 19th century basilica can be attributed to the location of the beheading of Saint Denis who was a city patron in the 3rd century. Legend has it that the Saint was martyred, after which the Bishop carried his head many miles to the north to the current suburbs of Saint Denis. Later in 1870, France was defeated by the Prussians in the war of Franco-Prussian. This led to the Commune of 1871 that resulted in the planning of the Basilica. The church was devoted to a religious order named The Scared Heart of Jesus which became popular after 1873. Later in the 1875 the foundation of the Sacré-Coeur Basilica was laid down. 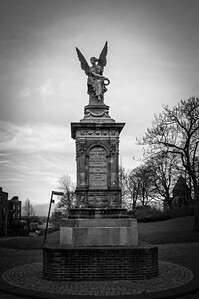 Its consecration took place in 1891 and it was fully completed in 1914. After the end of World War I in 1919, the church was elevated to a status of basilica.